Right before school let out for the summer, we conducted an interview with one of the Illinois MakerLab’s dedicated gurus, Rachel Kuehr. Rachel is a rising junior studying Supply Chain Management in the Gies College of Business. We were interested to learn about why Rachel loves working at the Illinois MakerLab. What are your responsibilities when working the Illinois MakerLab? I manage open hours, and help people start prints. I love when people come in with cool ideas and I get to help them 3D print it. I also 3D-print online orders, through our online ordering system. How did you get involved with the Illinois MakerLab? I truly just thought it was interesting and signed up to volunteer. It is one of my favorite RSO’s I am in on campus. The passion for 3D printing then expanded to my entire family. My brother is currently doing a research position that involves 3D printing at the University of Illinois. What is your favorite part about working in the Illinois MakerLab? I love seeing the awesome ideas that people come in with. There are some really cool buildings that are designed by architecture students. My favorite is watching someone’s idea come to life. What are some of the coolest objects that you have seen be 3D printed? I really like the life size, 3D printed man that we have in the Illinois Maker Lab. (Come take a selfie anytime!) 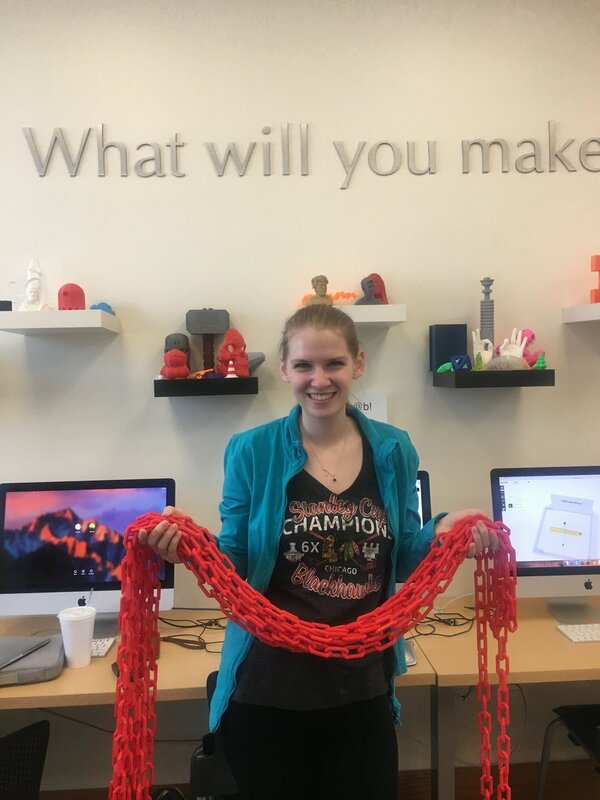 Recently, a red 20-foot-long chain was printed. It is interesting because while 3D printing is fun, it can also be useful. Pictured is Rachel holding the 20 foot-long-chain!